UW Medical Center has joined a list of U.S. early-adopter hospitals committing to serve only antibiotic-free pork and poultry. The decision comes in response to the rising global incidence of antibiotic-resistant bacteria, which increasingly thwart doctors’ attempts to rid patients of infection. Paul Pottinger, a UW Medicine infectious disease specialist, said he sees bacteria’s resistance to drugs – by dint of physicians’ overprescribing and antibiotics’ presence in food – as one of the critical developments of our time. Dr. Paul Pottinger says bacteria's growing resistance to antibiotics is one of the biggest issues facing medical caregivers today. “What wakes me up at 3 a.m. is the question, ‘What are we going to do to preserve the effectiveness of the antibiotics we have now? Right now we have a lot of antibiotics, but the more we use them, the less effective they become and the sooner they’re going to go away,” he said. UW Medical Center makes upward of 5,000 meals a day for patients and diners at its cafeteria, roughly 20 percent of which include chicken or pork, said Charles Zielinski, the hospital's director of Food and Nutrition. Timing of the change was determined partly by product availability, Zielinski said. He and his team had to identify manufacturers and be confident that its distributor could meet the hospital’s volume need. Even as more shoppers seek healthier food options, the “antibiotic-free” movement has not galvanized public discourse against the major U.S. processors of meat, pork and poultry. The recent recession has tightened many household budgets such that healthier options are out of reach or harder to rationalize. Giants such as Tyson Foods can still reliably sell drumsticks and breasts of birds that are dosed from birth with antibiotics to stave off disease in the cramped existence of processing plants. Seattle’s City Council today passed a resolution to condemn the use of non-therapeutic antibiotics in animal agriculture and, in doing so, to implore members of Congress to move forward with the Prevention of Antibiotics Resistance Act. Seattle would become the first West Coast city and the fifth U.S. city to pass such a resolution. 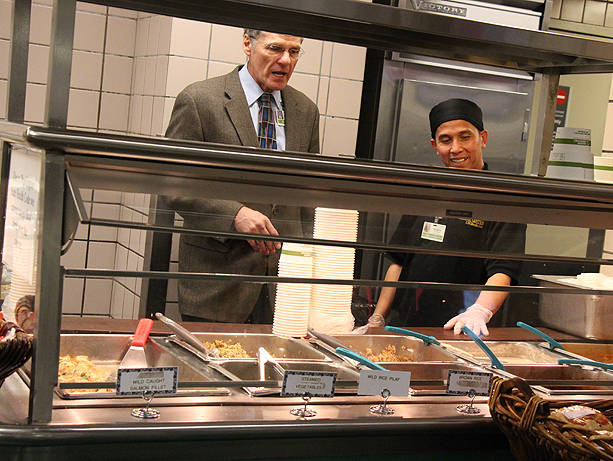 At UW Medical Center's cafe, Vic Sy serves chicken strips, one of the dishes that will change with the hospital's exclusive purchase of antibiotic-free poultry and pork. UW Medical Center’s implementation will take about six weeks and cost about $100,000 a year, Zielinski said. It is the biggest step so far in a health and wellness initiative that began in 2010 and involved recasting the cafe’s menu with meatless entrees and bigger servings of veggies. The bacon is now nitrate-free. “This is a one-step-at-a-time deal,” he said. The costs of widespread changes, like 100 percent organic dairy and produce and only antibiotic-free beef, are more daunting – in the range of a half-million dollars a year, he estimated. That’s a significantly steeper consideration as hospitals try to gauge their bottom-line impacts of the Affordable Care Act.